Digital pediatric scales provide precision accuracy and ensure child safety. Durable steel bases and easy-to-clean trays and seats guarantee longlasting reliability.The battery operated 524KL digital baby scale takes 6 "AA" batteries or can be purchased with an AC adapter which costs extra. Child seat provides safety and comfort and reduces infant movement. 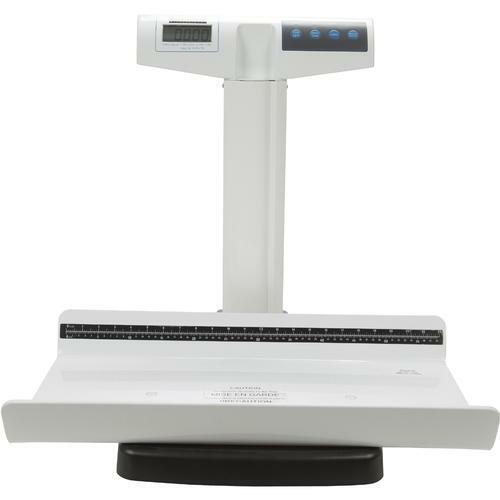 Health-o-Meters electronic pediatric scale is constructed of easy-to-clean ABS plastic. It is important to have a baby scale that can be cleaned easily because it should always be disinfected after every use. This eliminates health risks to young babies from being exposed to germs. Health-O-Meter 524KL baby scales come with an easy to clean, 24 1/4" (w) x 14 1/4” (d) x 18 1/2” (h) child seat which is more comfortable for the infant and prevents movement for more accurate readings. Hold/Release, Zero/Tare, KG/LB, Clear, Enter Functions. Child seat provides safety and comfort and reduces infant movement. Easy-read 1” high LCD display. 23 kg x 10 g 23 lb 24 1/8" x 14 1/2" x 2 5/8" (Tray) 24 1/8" x 21" x 23 1/8"
23 kg x 10 g 26 lb 24 1/4" (w) x 14 1/4" (d) x 18 1/2" (h) (Seat) 24 1/4" x 21" x 23 1/8"
24 1/8" x 14 1/2" x 2 5/8" n/a 13 7/8" x 25” x 2" 12 1/8" x 19 3/8" x 2" 15 5/16" x 24 1/16" x 3 1/2"